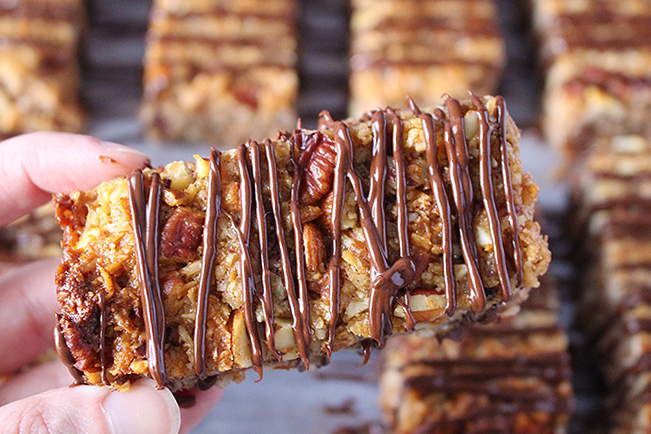 These Paleo Chewy Granola Bars are a great grab and go breakfast. Easy to make and so delicious! They are gluten free, dairy free, and sweetened only with honey. You will love them! 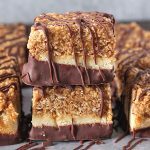 These bars are so easy to make and come together quickly. The most time consuming part is chopping the nuts and that’s not too bad. I used pecans and almonds, but you can use whatever nuts you have on hand. I was thinking how good these would be with cashews! Once they are baked they are thick, chewy, and just so good! These are so soft and chewy. One important tip is to pack them tightly- press them down in the pan before baking, after baking, and even press them together after cutting if needed. This helps ensure they stay together if you’re carrying them around. I want to answer a couple questions I may get. If you do have any others, let me know in the comments section below. Can I replace the honey with another sweetener? -Unfortunately, no. 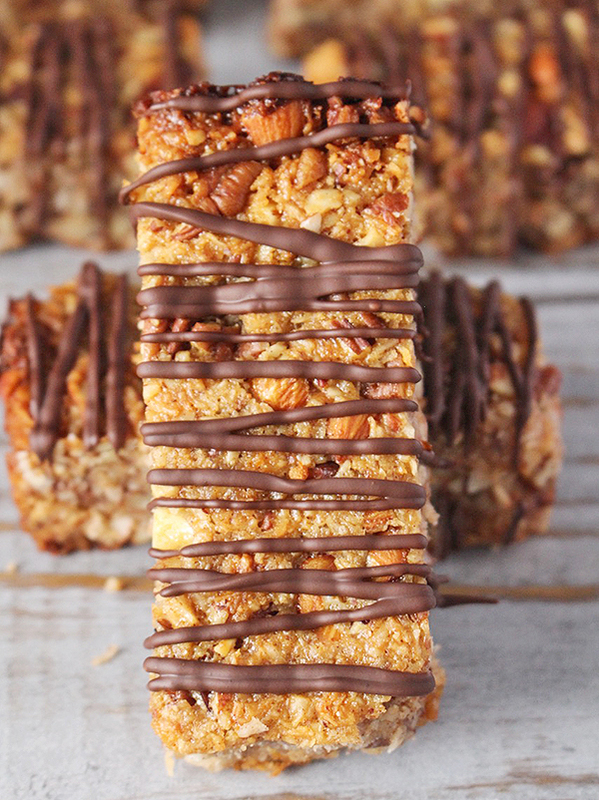 The stickiness of the honey is needed to help hold these bars together. Can they be made egg free? -Possibly. I haven’t tried it myself, but a flax or chia egg may work. 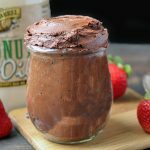 Can I use different nuts/nut butter? -Yes! Just make sure the measurements are the same and it should work great. What is the calorie count per bar? -I don’t know because I don’t count calories or fat or carbs. There are many places online you can calculate that if needed. Click here to order Golden Barrel Coconut Oil. Preheat the oven to 350° and line a 8x8 pan with parchment paper. Set aside. 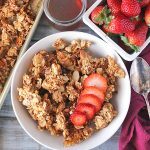 In a large bowl, combine nuts, coconut, cinnamon, salt, and almond flour. In a small bowl, mix together coconut oil, honey, and almond butter. Microwave for 10-20 seconds if needed to get smooth. Pour coconut oil mixture on the dry ingredients and mix until fully incorporated. Add the egg and stir again. Dump mixture into the prepared pan and press down to make very firm, as evenly as possible. This is an important step to get them to hold together. Bake for 30-32 minutes, the edges will be slightly brown. Once removed from the oven, press down again using a spatula. 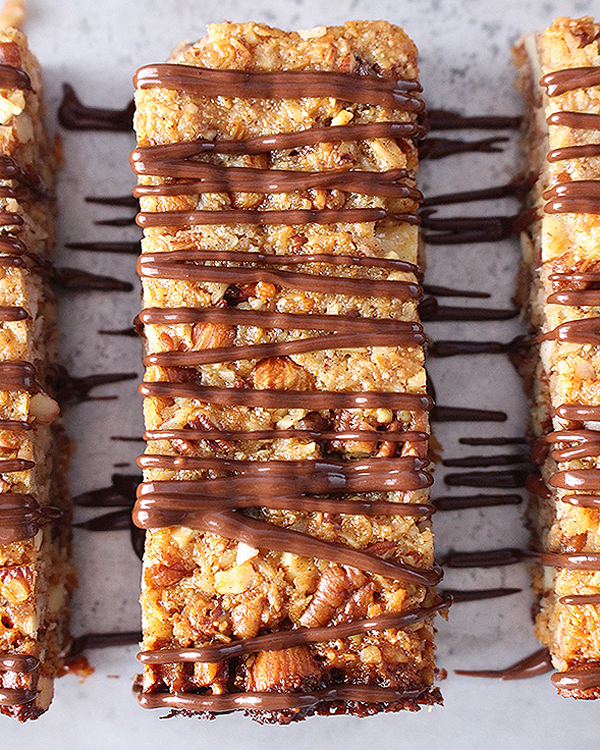 Once cool, cut into 10 bars.Melt chocolate chips in the microwave in 10 second intervals until smooth and drizzle over bars if desired. I read and re-read the instructions and I could not find where the egg was added in. I’m sorry Lisa! I forgot to include it, but it’s fixed now and added to step 4. Thanks for pointing it out so I could fix it! I hope you enjoy! 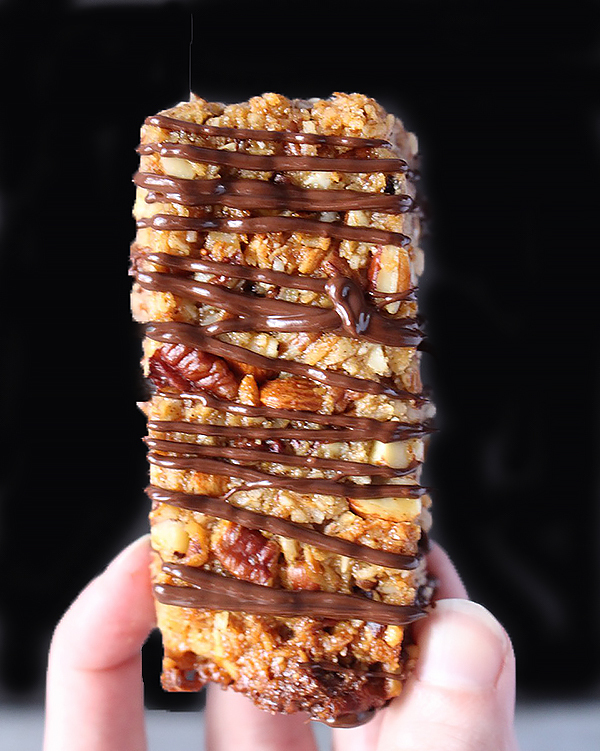 Do you have the nutritional breakdown per bar? Hi Kathyrn- no I do not, sorry! Hi there! 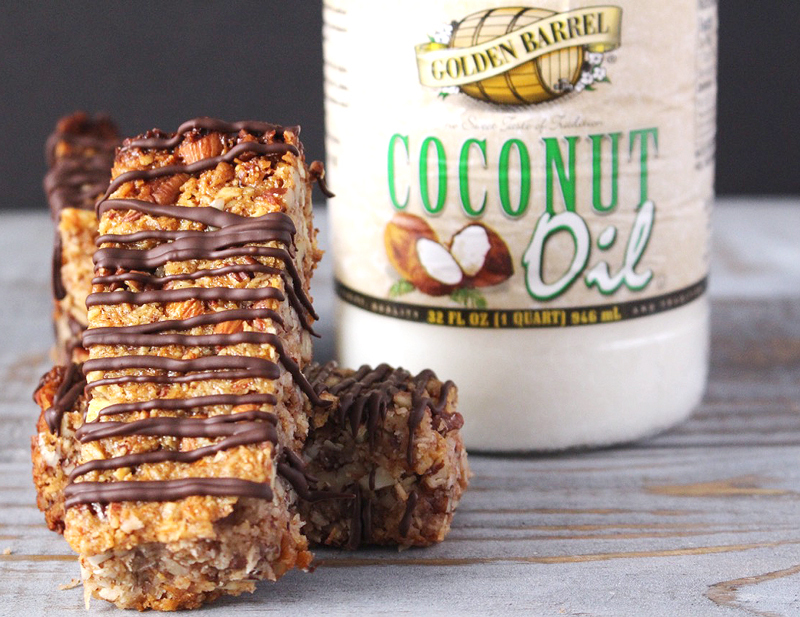 Do you have to use the unsweetened coconut? I really don’t like the taste of it very much. 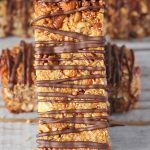 I’ve made non paleo granola bars before and omitted it but since this recipe calls for a lot of it, I am not sure how it will effect the recipe..thanks! Hi Melanie- yes, that will work. Hope you love them! If I cut the recipe in half, do I need to adjust the baking time? Hi Lauren- if you want to half it I would suggest using a loaf pan and keeping the bake time the same. I hope you enjoy! Thank you. These turned out great. I love them. What is the best way to store them so that they last the longest? It’s only me eating them, so a whole batch will take me a while to get through. I’ve been keeping them refrigerated because I love the flavor of coconut this way. How long will they last in the fridge if they are in an airtight container? Is freezing better if it is for several weeks? Thanks so much! I was wondering if I could substitute Sukrin gold fiber syrup for some or all of the honey ? I know the honey thickness & stickiness is needed to hold them together… I appreciate any advise you can give me. Hi Abby- I’m not super familiar with Sukrin gold fiber syrup, but according to their website it can be replaced 1:1. Is it as sticky as honey? You may know that better than me. 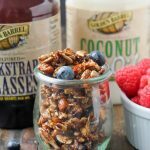 I say try it and the worst that could happen is they don’t hold together and it’s more of a granola. Hope that helps! I tried this recipe and it was DELICIOUS! My boyfriend even thought so! I made a double batch the 2nd time and will continue to make these! How would it be like if I substitute Almond butter with sugar-free peanut butter spread? Hi Merna- Yes, that would definitely work! I’d use a natural unsweetened kind since that’s what almond butter I used. It would be the closest. Hope you enjoy! Hi Lisa- yes, that will work! Hope you enjoy! Could you lessen the honey (sugar)? Hi Katie- sorry for the delayed response. 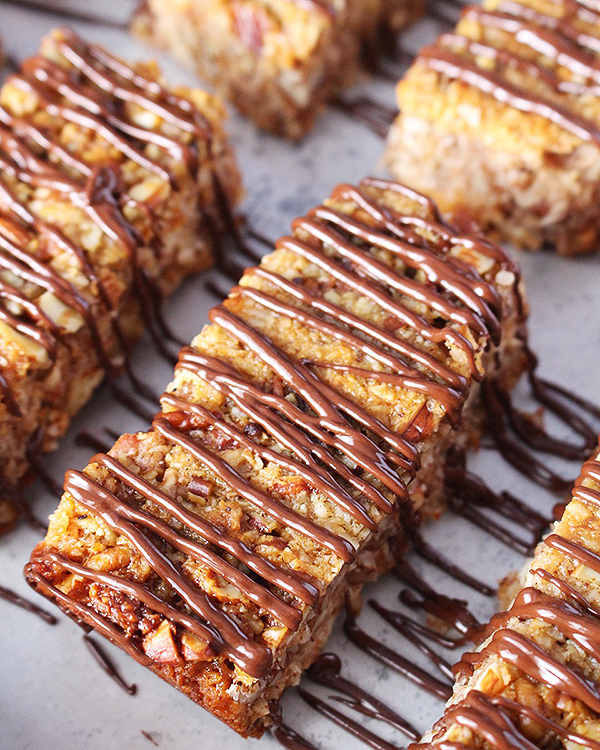 You may be able to a little, maybe to 1/3 cup, but it’s so important for the bars to hold together. I hope you try them! Hi, these are amazing and I make them all the time. Can they be frozen? Thanks for trying my recipe, Corrina! I think they would freeze great. Taste good but totally fell apart. Disappointed. I need to add another comment as I was disappointed they fell apart. Put all the pieces in a container in frig all night. This am scooped some up and the flavor is delicious. I will try again and chop nuts up finer next time. Maybe that’s why fell apart. Sure worth another try based on flavor. I’m sorry, Jayne! Thanks for trying my recipe, and I hope you can still enjoy them. Made these yesterday and couldn’t wait for them to cool completely before trying them.. they’re so good! I’ll definitely be making these again! Instead of almond butter, I used Once Again’s Organic Sunflower Seed Butter which is my favorite, and tastes way better than any almond butter I’ve tried. I also wasn’t sure mine wouldn’t fall apart since the batter was still gooey after I pulled them out of the oven, but letting them cool in the fridge for several hours did the trick. Thanks again for this delicious recipe! Thanks for trying them, Laura! I agree that Sunbutter is so good! I’m glad they turned out great even though you were unsure. You’re welcome. Thanks for the great feedback! What’s the best way for them to stick together? Mine fell apart. Does it make a difference for a baking dish vs. pan? They were amazing!!! However, I was eating it out of a bowl with a spoon. I don’t know what I did wrong. Hi Cee! Thank you for trying my recipe and I’m sorry they didn’t hold together. I am glad you still ate them, but want them to work for you. You have to really press them in the pan and again once they’re out of the oven. Let them cool before cutting and don’t reduce the honey at all. I hope that helps and let me know if you have any other questions.